Everyone in France (and outside) now has to rethink its political affiliation in three dimensions. After the victory of Emmanuel Macron, and the constant, tiring tension that came along, I feel the need to talk a little about French Politics. Indeed, after listening to the mumblings “from the left” arguing that he is the evil servant of big corporations and banks, “from the right” that he is an evil left-wing, family destructing, void of beliefs politician, and finally the screams of both sides (for once agreeing on something) angering about the pretended lack of representativeness of his election, I do feel the need to square things up a little about French politics and by extension many others democracies politics. Can everyone stop, one and for all, talking about “left” and “right” in politics. This has absolutely no meaning. I insist, none. This a very silly simplification of the political spectrum that only roots on the simple physical layout of most of physical representative chambers. On the left of the chambers sit “left-wing” people and on the right… well you get me. None of us can actually fell adequately represented in his subtle political sensibility through this. Don’t you think ? That is because there is actually not two but three main political ideologies, and it is time for everyone, especially the French, to realize this before claiming with passion that one is from “the left” or from “the right”. Politics are not a linear science, it has three dimensions, dimensions that do not oppose on everything, and that might even agree on some issues. First there are socialists. Those think that that social cohesion and collective happiness rely mainly on solidarity, the objective that no one will be left behind, that the weak will be protected against the strong. They are generally in favor of an extended role of the state in the society and economy. Their extremists extends this solidarity up to egalitarianism, and become communists. Liberals, the second group, think that this collective happiness rely mainly on the respect of individual liberties. They are overall in favor of a more limited role of the state. Their extremists even dream of abolishing it, they are anarchists. Finally, the conservatives, defend the social progress already achieved and moderate the public debate by advocating stability as a necessity for social cohesion. They are usually satisfied with the current social organization. Their extremists want more in this logic which is to go back to an “obviously” better past, their are reactionaries. This allows us to understand that there is no fundamental disagreement between those three ideologies of political action as long as they all participate in a moderate way to the debate. 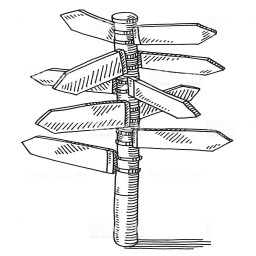 No right or left. Only three visions on the required ways to reach the same goal: common interest. And those three might be right or wrong, together or separately, it all depends on which issue is addressed. But we can anyhow add an other “dimension” which is what we could call “moderation level”. Whatever the mix of his/her political sensibilities, anyone can exerts various level of listening and open-mindedness. In order to clarify this let’s draw a little chart, void as for now, and allowing us to place individuals and political parties. Careful, I did deliberately put socialists on the right and conservatives in the middle to shuffle a little the usual vision. 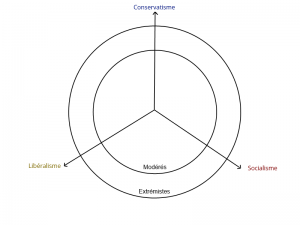 The three axis allow us to measure the level of moderation / extremism according to the three ideologies. And I invite you to try to locate yourself right now. This representation is of course subject to numerous comments, modifications and adjustments but you understand the basic principle. You can specifically identify overlappings. They are the very source of party switch, betrayals and, of course bipartisanship. There is no right or left, but there is very broad mix of liberals, socialists and conservatives. Each one of us should therefore stop defining oneself as “from the left” or “from the right” but more as a socialist, liberal or conservative. I also advise you to try to determine, honestly, your level of moderation (you should definitely know if you are an extremist !). National and federal representative chambers should take this into consideration et reorganize physically. I would advise a circular chamber ( some kind of stadium but political sport ). Extremists would be put in the back, if for anything else to separate them the progressive majority in the center, and from each other. 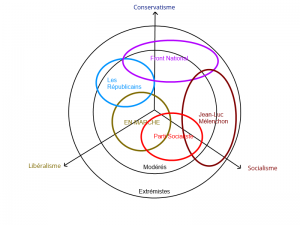 Finally This representation allows us to better understand the current political evolution of parties in France and and in many other democracies as well. There is always a clear need for three parties and not only two (as in the US which has a big problem with this). UK has already those three parties, as well as Germany. France just made it, and it is for the best. Let’s hope this stays and grow roots.